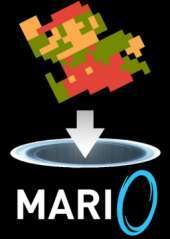 Have you ever wondered what Super Mario Bros. would be like if Mario could wield the portal gun from Valve's Portal? Well, wonder no longer. Levels from SMB are faithfully reproduced, offering new possibilities for navigating the Mushroom Kingdom, using keys to move and the mouse to aim, as well as 2D levels of Portal puzzles.